This is the second 29er that I have seen so far for sale on Craigslist in CT. Definitely love those cranks and the pedals are great, too. At first I thought this was overpriced but when you look at all the parts it is pretty good bargain. 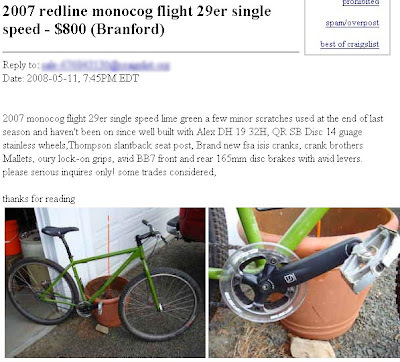 What I find particularly interesting is that Cycle Snack gets many visits from people looking to buy 29ers from Craigslist. I guess if you want to try the koolaid, you want to go bargain basement.